GEMU 102 Solenoid Valve is a 2/2 way, PVC-U plastic solenoid valve suitable for inert and corrosive* liquids and gases. 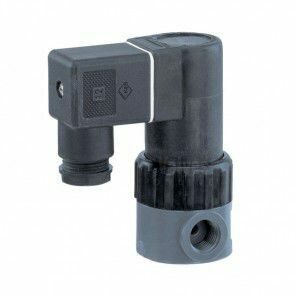 A directly controlled 2/2 way plastic solenoid valve featuring a plastic encapsulated DC solenoid, EPDM seal and DIN ISO 228 connection. Due to it's corrosion resistant properties the Gemu 102 is ideal for use in water treatment plants, washing and cleaning installations, food manufacturing, chemical industries, electroplating, photographic applications and for laboratory, analytical and medical apparatus. In addition, a built in manual override allows the valve to be opened and closed during a power failure. Available in sizes: DN6, DN8 and DN10. Voltages: 24V DC, 24V AC, 110V Ac and 230V AC.